We talk to Kevin from RogueDeckBuilder.com about what’s currently hot in standard. We successful streaming on Twitch.tv. Visit twitch.tv/mtgyou to see the archived show. We have contest winners for the Rogue Deck Contest. Thanks to all those who sent in deck list! 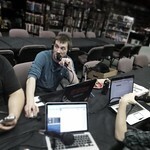 We will be sending out RogueDeckBuilder.com playmates to Chris, Peter and Bruce! Give us a 5 star review on iTunes: we are giving out a RDB.com playmat and a CD by the Andrew Allen Trio called Free Play (Free Play is a collection of iconic video game themes arranged in classical jazz styles). [Clique You] Casual Commander Twitch Stream.